Being around nonthreatening animals, domesticated or otherwise, calms humans. The reason for this seems buried in our prehistory: Back then if we were around other creatures and all was peaceful, that meant predators weren't lurking nearby, about to pounce on us. Plus, the weather was probably fine, too. The good news is that design can make animals happier, just as it can people. 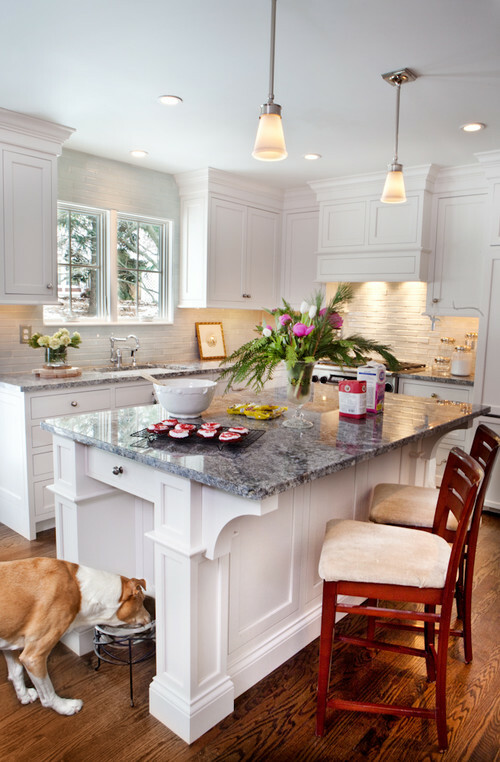 You can create a home where your pets feel as good as you do. It's hard to read the minds of pets, but when you learn more about them as they spend time in your home, you'll find ways that you can make your special animal friend feel particularly happy. Here are just a few ways to keep pets in good spirits. 1. Some privacy, please! Make sure your pet has privacy. Cats feel most comfortable in their litter boxes if they're in a space all their own. Dogs may need a place in your home where they can get away from demanding children or loud music, too. 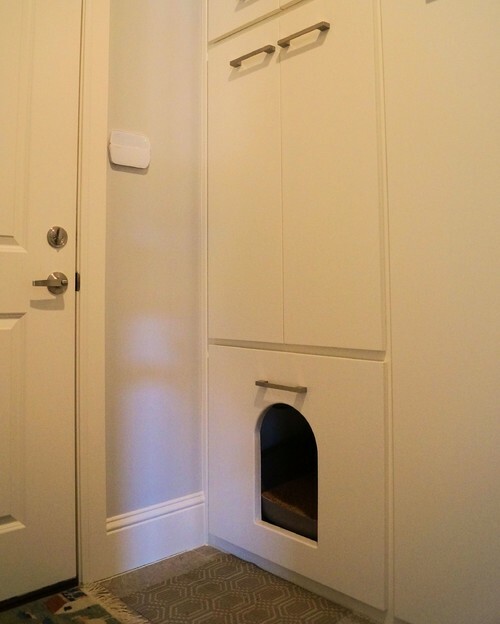 A covered kennel, doghouse or bed in a laundry room might be just the thing. 2. 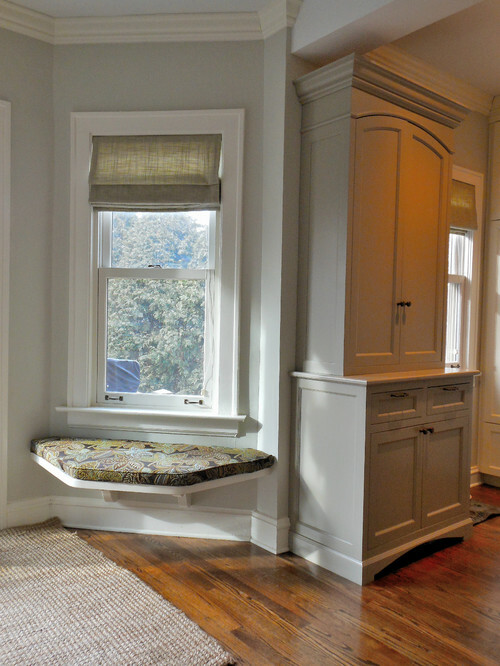 Create sheltered spaces for pets to lounge in. Pets need places where they can decompress, just as you do. Those areas don't always need to be completely away from humans, however. Our pets are social but good at self-preservation, just like we are. Most animals, including humans, feel secure when danger can't sneak up on them. While in today's world that's not as likely as thousands of years ago, we're still hardwired to think that way. So providing a secure spot where a pet can really let down his or her guard is important. This feline feels at peace because the chair has a high back and is in a corner, assuring the cat that nothing's going to sneak up. Provide that security and you'll have a calm, happy pet. 3. Build in a view. Pets need to survey their territory. Being able to look out the window while relaxing, as dogs and cats can do on this cushioned shelf, is doubly desirable. If you don't have high windows, consider putting a secure pet gate on an opened door that leads outside. 4. Let in sounds and scents. Animals rely on smells and sounds more than humans do. To let them feel safe, having open windows allows them to hear and smell what's lurking in their surroundings. 5. Include places for exercising. Cats enjoy climbing on cat trees, shelves, furniture, anything that allows movement and elevates them off the floor. Small dogs enjoy being able to run down long halls without slipping and sliding, so add carpeting when possible. 6. Support aging pets. As pets get older, their needs change, just as humans' do. Recognizing those changes will prolong the positive relationship you have with your pet. Dogs' joints, like ours, stiffen up when they get older. Senior dogs enjoy eating from a bowl placed on a stand or short bench that raises the bowl high enough above the floor so they can eat in a regular standing posture — no need to lower the front part of the body or head too much. Your turn: What is your pet's favorite place in your house?